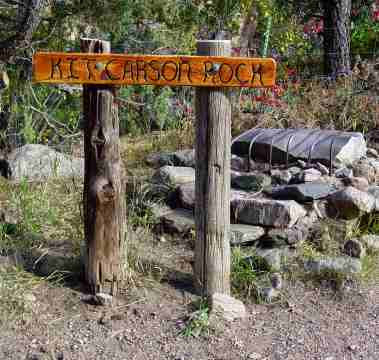 Unmarked for decades, the so-called "Kit Carson Rock" in eastern Custer County, Colorado, has recently sprouted a new sign, part of some locals' attempt to reclaim the past and commemorate things in the uncomplicated way that they used to be commemorated. Here is a close-up. If you can read "C. Carson" in there, your eyes are better than mine. But there is no "W" in "Christopher Carson." Furthermore, Kit Carson could not read or write. He could barely scrawl "C. Carson" on documents when he had to. Illiterate people on hurried cross-country rides from, let's say, Fort Pueblo to Taos do not pull chisels from their saddlebags and start carving during a lunch stop. I am not a geologist, but that does not look like the rock from that part of Hardscrabble Canyon, where sandstone predominates. Someone could have asked Professor Anderson, but I do not think that anyone bothered to do so. The legend of the rock has been around for a while, however, even with that problematic "W". A 1948 Forest Service map of the San Isabel National Forest pictures it too, complete with the protective iron bars. At that time, Colorado Highway 96 ran past it, before the road was re-routed. Local writer Hal Walter came to the same conclusion: the rock has nothing to do with Carson. But I suppose some people want to associate a famous name with this area--and Carson certainly might have traveled up Hardscrabble Canyon, one traditional route towards the Sangre de Cristo passes and into the San Luis Valley. Trying to claim he carved his name, though, is sort of like saying "George Washington slept here." Meanwhile, take Walter's advice and read Hampton Sides' Blood and Thunder. It is a tightly paced story of the interaction between Carson, the New Mexicans, the Navajos, and the US Army during the 1840s-1860s. Sides writes without bias of the Navajos' raids on the New Mexican settlements, the Hispanic slave-catching raids against the Indians, and finally of how Carson, who himself had many Native American friends, accepted the task of forcing the Navajos on the "Long Walk" to Bosque Redondo and captivity. An excellent book. Meanwhile, I will have more to say of the attempt to control the story of the past in Custer County. Labels: Colorado, Custer County, history, Wet Mtns. Follow this link to a 1925 Wet Mountain Valley News story (from Westcliffe) about this rock. Click on the first story, it should help. The Wet Mountain Tribune article is written jovially but merely repeats information from the Pueblo Chieftain, filling in the gaps with talk of "mystery." If you can make out "Kit C___, Juan ___ and "Chit W___" in those letters, you have more imaginative eyes than mine. I stand by the fact of Carson's well-known illiteracy. Kit Carson was a trader, not a "fort" builder. I suspect that his name was attached to something built by someone else — much like the rock.